With all the rain that we have been having this year in Atlanta homeowners are looking for landscaping alternatives to help maintain and control flooding and drainage problems that we are seeing in our yards. There are several alternatives, but rain gardens are one that enhances the beauty of your yard and a less expensive alternative as opposed to storm water treatment structures. A rain garden is a garden of local shrubs, perennials, and flowers planted generally on the downside of a slope on your property. They are a fun family project and can be created in one afternoon. You can do it yourself or use your landscaper to help you create your rain garden. By using local and native plants you avoid the use of fertilizers and pesticides. Rain water gardens are designed to hold and soak in rain water runoff that flows from roofs, driveways, patios and your lawns. Rain gardens are effective in removing up to 90% of nutrients and chemicals and up to 80% of sediments from the rainwater runoff. Compared to a conventional lawn, rain gardens allow for more water to be absorbed into the ground and require minimal care. A rain garden is not a water garden or a pond. 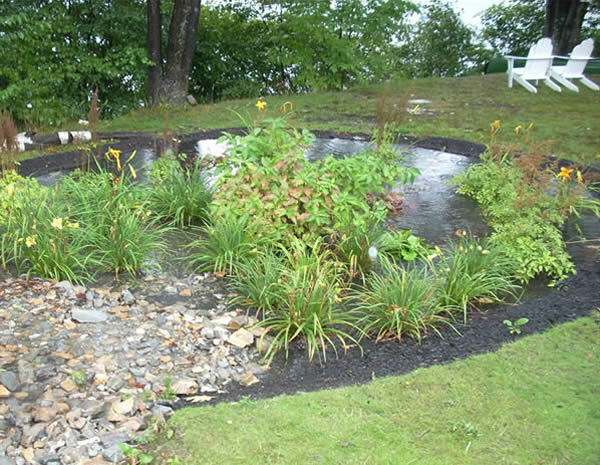 A rain garden is dry most of the time. It typically holds water only during and/ or following rain. Every time it rains, water runs off impermeable surfaces, such as roofs or driveways, collecting pollutants such as particles of dirt, fertilizer, chemicals, oil, garbage, and bacteria along the way. The pollutant-laden water enters storm drains untreated and flows directly to nearby streams and ponds. The pollutants carried by rainwater runoff account for 70% of all water pollution. Rain gardens collect rainwater runoff, allowing the water to be filtered by vegetation and percolate into the soil recharging groundwater aquifers. These processes filter out and reduce the pollutants into our lakes, streams and ponds. They are very Eco friendly and are becoming more and more popular in landscaping alternatives. The City of Atlanta has more information about rain gardens, download a free copy today for your reading pleasure!